UKIP leader Nigel Farage has said his party will be "serious players" at the 2015 general election after it made gains in council polls across England. 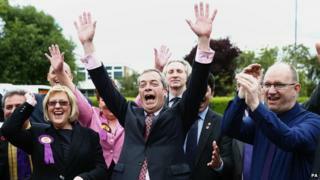 Mr Farage said the "UKIP fox is in the Westminster hen house" after it gained more than 150 council seats. The BBC's projected national share of the vote suggests UKIP would have scored 17% in a Britain-wide election. Labour would have got 31% of the vote, ahead of Conservatives on 29% with the Liberal Democrats on 13%. UKIP's projected national share figure is lower than the 23% it got in council elections last year and despite its gains, UKIP does not yet control any local authorities. Media captionUKIP will choose target areas and "throw the kitchen sink at them". Elections expert Professor John Curtice said UKIP's lower vote share this year reflected its weak performance in London but remained "remarkably good". Labour would be "disappointed" to be only two points ahead of the Conservatives, he added, a lead down from 4% last year and 7% in 2012. The Conservatives could be pleased with an increase from 25% share last year, but remained down on the 31% of 2012, Prof Curtice said, adding that the Lib Dems were showing little sign of recovery, with their share down 1% on last year's record low. Labour has gained Hammersmith and Fulham, Croydon, Harrow and Amber Valley from the Conservatives, and the Conservatives have gained Kingston upon Thames from the Lib Dems. Mr Farage, whose party only had two councillors when these seats were contested in 2010, said: "There are areas of the country where we have now got an imprint in local government. Under the first-past-the-post system we are serious players." Prime Minister David Cameron sought to quell speculation of a possible Conservative-UKIP alliance, saying that his party could achieve an overall majority in 2015 by itself. "We are the Conservative Party. We don't do pacts and deals. We'll be fighting all out for a win at the next election," he said. He hailed his party's successes in Birmingham, Swindon and Tamworth, but conceded: "We did lose some councillors and some good councils - that does happen when you're running the government. I'm sorry for those who have lost their seats." Media captionDavid Cameron: "We've got to work harder and really deliver on issues that are frustrating people"
The success of UKIP in Essex cost Labour control of Thurrock council. And in the Labour heartland of Rotherham, UKIP took 10 of the 21 seats being contested. Senior Labour figures acknowledged the party needed to do more to convince people they understood their concerns. Labour leader Ed Miliband said: "I think what we heard last night was a deep sense of discontent with the way the country's run and a deep desire for change. "Across the country you've seen people voting for Labour to make that change happen: from Croydon, to Hastings, to Cambridge. "You also saw some people turning to UKIP - and I am determined that over the next year we persuade them that we can change their lives for the better." Media captionEd Miliband: "I'm determined over the next year we persuade them [UKIP voters] that we can change their lives for the better"
But Labour backbencher Graham Stringer - a longstanding critic of Mr Miliband - launched an attack on the party's campaign calling it "unforgivably unprofessional". He told the BBC: "We have not done as well as we should have done in both the presentation of our policies and the organisation of the campaign. Media captionUKIP's Winston McKenzie: "Certain sections of the press, together with the coalition... have played the race card, 100%"
Labour's shadow foreign secretary and election strategist Douglas Alexander dismissed the criticism, arguing that the party was making good progress in "key battleground marginal seats". Some Conservative backbenchers have called for an electoral pact with UKIP going into the general election, with Jacob Rees-Mogg warning UKIP could split the "small c conservative vote" and let Labour in. Conservative Party chairman Grant Shapps rejected a formal deal between the two parties, saying there was "no question of a pact per se". The BBC's political editor Nick Robinson said UKIP had emerged as a "fourth national political force capable of disrupting the hopes and plans of each of the established three parties". Although they did not win any councils, he added, UKIP had "completed the move from party of protest competitive only in European elections to one that is wounding the big three up and down the country". Media captionNick Clegg: "We realised it was going to be tough"
But Lib Dem leader Nick Clegg said all of the "mainstream" parties had had a mixed night as a result of the "very strong anti-politics mood". "Where we can work really hard and tell our side of the story, we can win," he said. But it was "never easy to see dedicated hard-working Lib Dem councillors losing ground", Mr Clegg added. In Northern Ireland, counting is taking place in 11 new "super districts" councils, with 462 seats up for grabs. All results should be known by Saturday evening but the DUP and Sinn Féin are expected to take most of the seats.